Infinity is looking for a board certified music therapist to join our team immediately. We are looking for a clinician who is passionate about working with individuals with developmental, neurological, and mental health needs. We are looking for a a therapist who is an out of the box thinker who is able to work independently and collaborate as part of a team. We would prefer a clinician with experience working with individuals with Autism, Down Syndrome, Anxiety Disorders, Epilepsy, and Reactive Attachment Disorder. Schedule: This position will include daytime, afternoon, and evening hours based upon the needs of our clients. This position will be a 5-day work week with 2 consecutive days off. The exact days will be determined based upon client need as we move into the school year schedule. We are able to offer some flexibility with scheduling for the right candidate. We are looking for someone with some flexibility as their schedule is being developed. The vast majority of our clients request services between 3:00pm-7:00pm at night during the week or on 9:30am-4:30pm on the weekends. As a member of our team, you will be expected to attend team meetings at our Southington clinic on Tuesday mornings from 9:15am-11:15am. Location: This caseload will be primarily stationed in Fairfield county. We work in a team-based model. You may be asked to work outside of your region during one-time events, to sub for a therapist, or for various other regions. We believe in keeping caseloads condensed, when possible, to minimize driving. Salary: Following a training period at a competitive hourly rate, you will be transitioned to a salaried schedule. Our full-time salary starts at $40k/yr plus benefits; part-time staff are paid a proportionate salary to the schedule. At Infinity, we believe in financial stability for our team. Our team members receive their full salary regardless of inclement weather closings, client cancellations, or holidays impacting their schedule. Responsibilities: As a member of our team, you will be expected to provide individual and group music therapy sessions to children and adults diagnosed with developmental disabilities, mental health disorders, neurological needs, wellness needs, etc. You will be expected to write treatment plans, keep accurate data, write clinical reports, and ensure that client schedules are maintained. You will participate in treatment team meetings, assist with team functions including marketing events, and complete general administrative tasks such as keeping your timesheet and maintaining client budget spreadsheets. In addition, you may be asked to fulfill non-clinical responsibilities such as teaching music lessons or providing music enrichment groups. •	You have experience working with children and adults with developmental disabilities. •	You believe private practice is a “starter job”. •	A typed sample 45-min session plan for an 8-year-old with Autism who loves Disney with a focus on verbal communication skills. Please include two goals with two objectives each. •	A typed sample 45-min session plan for a group of 15-year old adolescents in therapy for anger management. Please include two goals with two objectives each. •	A video demonstrating your vocal and guitar skills. Recipient’s name Connecticut Music Therapy Services, LLC is happy to announce that we are looking to add a board certified music therapist to our clinical team! The start date of this position will be immediate. This is a new .5/half time position anticipated to move to a full time/benefits within 6 months. This position is right for you if: -You are passionate about working with children and adults with special needs, as well as with older adults within a relationship-centered, music-centered framework. -You are a skilled clinical musician, strong in voice, guitar and piano -You live in, or are willing to live in and travel within Connecticut -You enjoy a variety of clientele and enjoy a variety of clinical settings- private homes, schools, clinic, nursing homes, community settings. -You are flexible and willing to work afternoon/evening hours and potentially on Saturdays -You are dependable, responsible and a team player. -You hold current MT-BC status. We are looking for a responsible and dynamic therapist to join our team, therefore this might not be the right position for you if you are looking to establish your own private practice right now, if you are not a good communicator via writing, email and phone, if you are not able to provide transportation between clients or willing to travel throughout your day or if you are not willing grow as a person or clinician. Connecticut Music Therapy Services, LLC is an established private practice that serves children and adults with developmental and brain health needs in home, school, community, and nursing home settings throughout the state of Connecticut as well as in our Watertown and Fairfield offices. We are seeking to provide an exciting and supportive work experience for a flexible, motivated, energetic, and talented clinician. Some equipment and instruments, clinical supervision and continuing education experiences will be provided. Along with a competitive pay rate, heath insurance reimbursement and other additional benefits are available to our full time employees. For more details, please see below for job posting and application details. 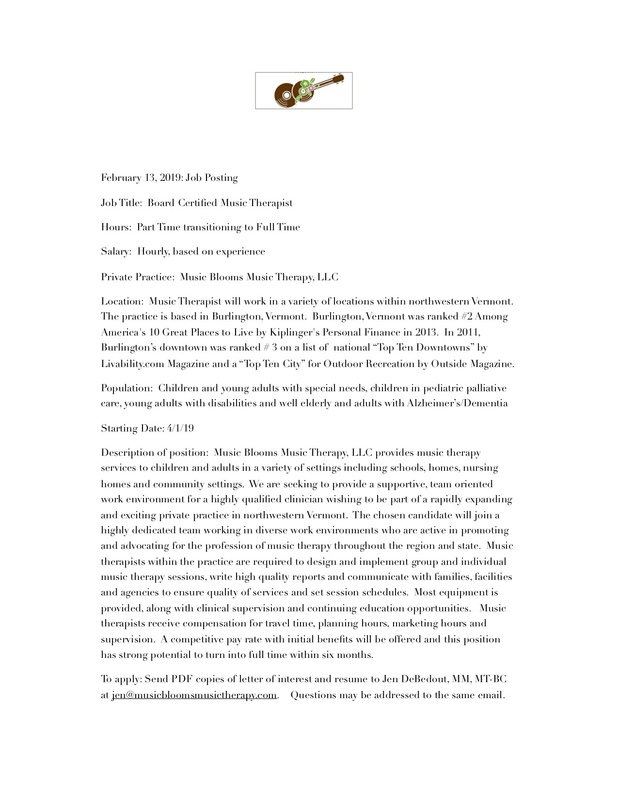 August 1, 2018: Job Posting Job Title: Staff Music Therapist Hours: .5 Part Time moving to Full Time Salary: Hourly, based upon experience Facility: Connecticut Music Therapy Services, LLC City and State: Music Therapist will work in various settings in CT based on geography and availability. Qualifications: Bachelors degree in music therapy or its equivalent, MT-BC required. Clinical experience with individuals with special needs and older adults preferred. In addition to excellent musicianship, the successful candidate must possess excellent interpersonal, verbal and written communication skills and a strong desire to work with children and adults in a variety of settings. Reliable transportation and a working cell phone are required. Population: Children and adults with special needs, well elderly, adults with Alzheimers/ Dementia. Starting date: Immediate Description of position: Connecticut Music Therapy Services, LLC is a private practice that serves children and adults with developmental and brain health needs in home, school, clinic, community, and nursing home settings in Connecticut. We are seeking to provide an exciting and supportive work experience for a motivated, energetic, and talented clinician. The successful applicant will have the opportunity to gain experience in a wide variety of settings with a fantastic group of clients. Some equipment and instruments, clinical supervision and continuing education experiences will be provided. Along with a competitive pay rate, heath insurance reimbursment and other additional benefits are available to our full time employees. 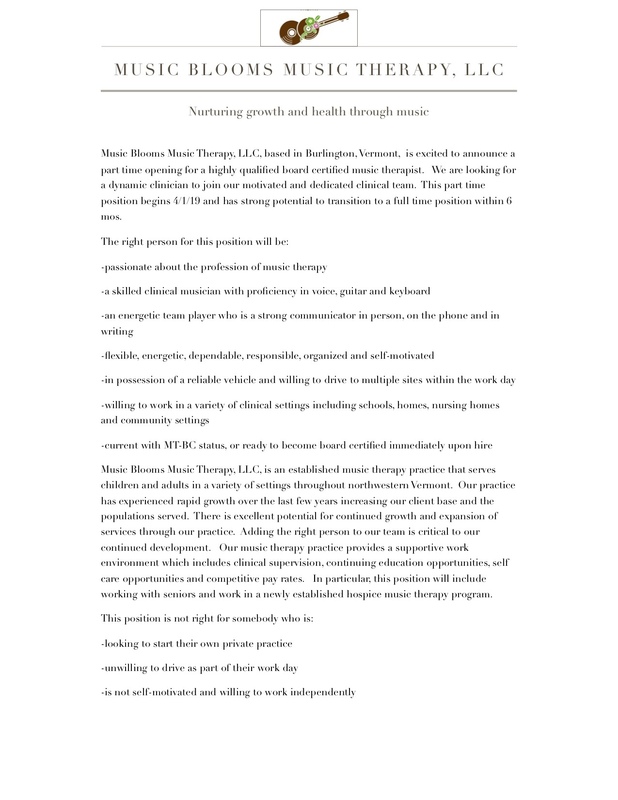 To apply: Send PDF copies of letter of interest and resume to Emily Bevelaqua, MMT, MT-BC at emily@ctmusictherapy.com. Questions may be addressed to the same email.